Kruger National Park , South Africa, 2018-Apr-23 — /Travel PR News/ — Singita is taking its community partnership programme, the Singita Community Culinary School, and food offering to the next level with a series of epicurean additions in 2018. Guests at Singita Lebombo and Sweni Lodges will be treated to a new demonstration studio at Singita Lebombo, an opportunity to recreate acclaimed chef Liam Tomlin’s dishes with Singita’s cooking classes and visit the overhauled Singita Community Culinary School. 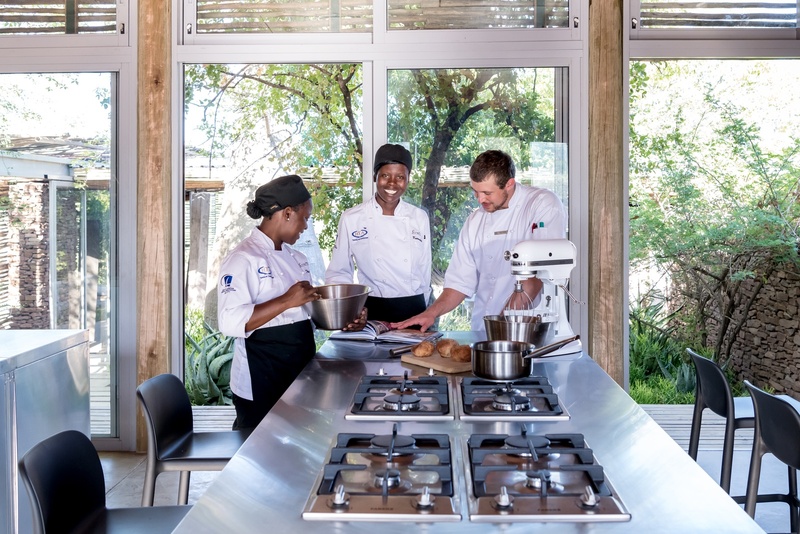 One of Singita’s key conservation programmes, the Singita Community Culinary School (formerly the Singita School of Cooking) has been rebranded and overhauled with a curriculum compiled by the Hospitality Trainers and Associates (HTA) School of Culinary Art which is an internationally recognised City & Guilds’ accredited curriculum. As part of this, ten candidates selected from surrounding communities embark on a 12-month course and they spend time learning the basics at the new cooking school, followed by stints working in the five lodge kitchens in South Africa. Equipped with culinary skills and hands-on experience in high-level kitchens, graduates leave with the know-how and confidence to apply for a commis chef position in any professional kitchen. Working with headline chef Liam Tomlin, Singita has re-conceptualised menus at the South African lodges to include fresh, local ingredients and dishes that even well-travelled guests may not have experienced. Drawing on these ingredients, Liam has created a menu of deceptively simple, pared-down dishes of superior provenance plated without fuss – a signature he is renowned for at his award-winning Chef’s Warehouse restaurant in Cape Town. Singita Lebombo’s new demonstration studio will offer guests a unique opportunity to see these dishes come to life, and be introduced to the range of experimental, artisanal cooking techniques introduced by Liam and Andrew Nicholson, Singita’s Group Executive Chef. This will be complemented by Singita’s newly introduced cooking classes, a hands-on experience which will allow guests to translate their observations into real skills. Recipes will draw on both traditional South African dishes and a bespoke selection from Liam Tomlin’s menu. Guests are asked to give a donation of R650 per person per class to be a part of supporting the ongoing work of this important community skill development. The evolution of Singita’s food culture all started with the reopening of Singita Lebombo Lodge in the Kruger National Park in May 2016. Liam worked closely with the entire team before Singita Lebombo’s re-opening and continues to do so now that the new kitchen is ‘live’ and on show. Liam’s trademark tapas form the basis of the relaxed dining style inspired by Lebombo’s chic, contemporary spaces. This experimental style of eating encourages sharing while exploring different tastes and flavours. It has increased choice, shifted the emphasis from quantity to quality, and given guests the freedom to eat as little or as much as they want. This gourmet transformation then followed through with reconceptualised menus at all of the South African lodges, offering guests a unique culinary circuit with varying flavours and cooking techniques inspired by the setting and style of each lodge. Singita is a conservation company that has been preserving African wilderness for the past two decades. Through an exceptional safari experience with 12 award-winning lodges and camps across South Africa, Tanzania and Zimbabwe, Singita is able to partially fund the protection and preservation of pristine land and existing wildlife populations, not to mention help create economic independence within local communities surrounding the reserves. The Dublin-born Tomlin settled in Cape Town in 2004, after 13 years at the cutting edge of Australia’s sophisticated food scene. He has earned a loyal following for his tapas tasting menu at the award-winning Chef’s Warehouse on Bree Street in Cape Town, and subsequently has opened Thali also in Cape Town, and Maison in Franschhoek. Drawn by the array of surprise, ingredient-driven plates, Singita recognised that Tomlin was ahead of his time. When Tomlin opened his Cape Town eatery, he was tapping into a global trend for swopping starched white tablecloths for bare wood tables and the freedom of not being tied to any particular cuisine. This is the style and ethos Tomlin brings to Singita’s new way of safari dining. This entry was posted in Food & Drinks, Hospitality, Hotels, Recreation, Resorts, Travel, Travel Education & Courses, Travel Services, Travelers and tagged Andrew Nicholson, cooking classes, Liam Tomlin, Singita, Singita Community Culinary School, Singita Lebombo, Sweni Lodges. Bookmark the permalink.